Bloom! Lighted Flower Pots from Lekker - SALE! Bloom! 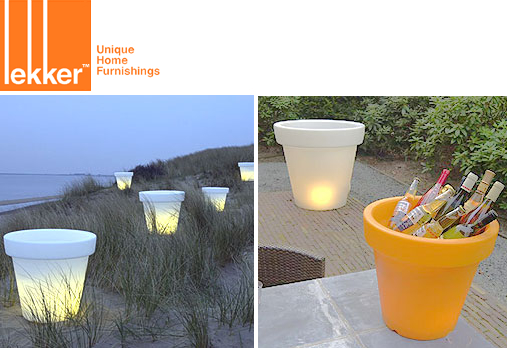 lighted flower pots, winner of the Dutch Design Awards 2004, defines functional design since they're flower pots, lights and a cooler all in one (just add ice and coronas!). These oversized all weather planters bring modern style and ambient illumination to your outdoor space, not to mention lots of "whoa, cool" comments from your peeps. Since we all love a good deal, you can get yours now at Lekker online (or in their Boston store) marked 30-50% off! My New Kikkerland Flip Clock!